Want an eBook reader, but don’t want to pick up a commercially available unit from Amazon, Sony, or another company? One Australian hacker decided he didn’t want to pay the shipping charges to get an eBook reader from the US, so he picked up a cheap Eee PC and started down the long path to turning it into a dream eBook reader. Of course, along the way he’s probably spending more money on parts. And there’s no way the time he’s spending on the project is worth the few hundred bucks he’s saving. But that’s hardly the point, now is it? 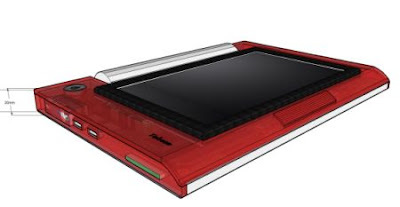 Here’s what an Eee PC-based eBook reader has that most dedicated devices lack: a color screen, and a fully functional computer that’s capable of browsing the web or performing other duties. He’s even throwing in a touchscreen for good measure. Here’s the down side: The battery life on an Eee PC stinks compared with commercial eBook readers. The project is far from complete, but you can follow its progress at the Overclocker forums. In case you couldn’t tell, the image above is a concept drawing of the finished product. YES!!!!! That is sooo great!